Director Peter DeLuise during a break in the action. Peter kindly advises Director of Photography Jim Menard about his lighting preferences. 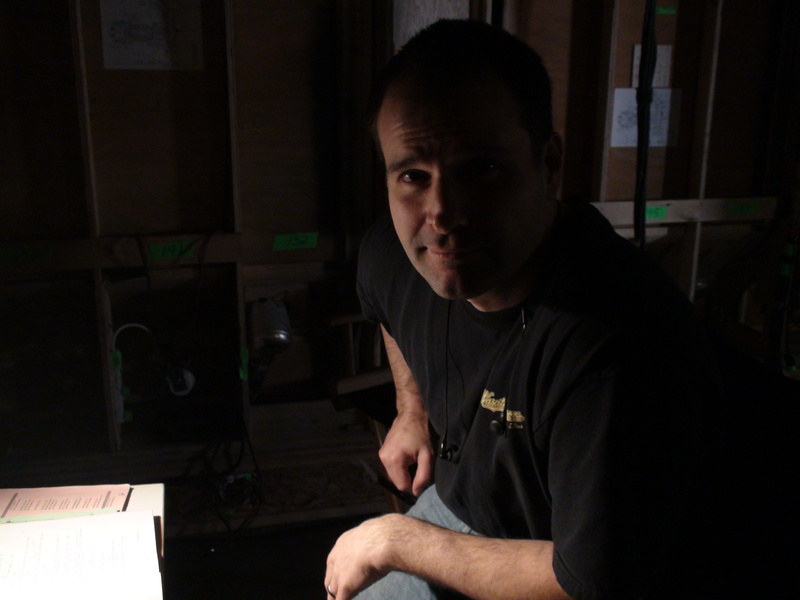 Yesterday, I was over on Stage 2, watching Peter DeLuise direct the shuttle sequences in Fire. Boy, that shuttle is a beauty. Someone referred to it as “a puddle jumper on steroids”. Anyway, enjoy some shots of Peter in action. My annual chocolate party. It’s going to be tough to beat last year’s shingding (http://josephmallozzi.wordpress.com/2008/04/27/april-27-2008-the-best-chocolate-party-ever/). But, of course, I’m going to try. Answer: Nope, sorry. It’s the studio keeping the set under wraps fore the foreseeable future. Answer: All four dogs are doing great – although the pugs are looking a tad chunkified after all that home cooking. Answer: They were more interested in their barbecue chicken. Answer: Looks like it’s going to be me, Ivon, Lawren, and Carl sampling the exotic offerings of my liquor cabinet. Root beer schnapps, here we come! Answer: From what I hear, they’ve settled in quite nicely. And those who’ve taken me up on my restaurant suggestions have enjoyed themselves. Answer: Soon, soon. Joel has been busy working on the SGU theme. Answer: Hmmm. I loved The Name of the Wind. Perhaps a potential June BOTMC selection? Answer: Given the premise of the series, it will be darker and more serialized than SG-1 or Atlantis. That said, there will still be plenty of opportunities for humor and the series will be firmly rooted in established Stargate mythology. Yes, the series will focus on survival, but it will also focus on exploration and adventure – and, by extension, the occasional alien encounter as well. Answer: Hoping Flannery is on the mend! Major D. Davis writes: “1. What is the budget for Air (all three parts)? 2. What will the budget for a normal one part Universe part be? 3. Will the Atlantis movie budget be 7 million dollars? Answers: 1. A significant amount. 3. Theoretically, it could be anything. Answer: Haven’t seen it but have heard good things. When the box set comes out, I’ll no doubt pick it up and watch it with the wife. Answer: Syracuse? Really? I thought SYR stood for Syria. Answer: Well, I guess that’s it, everybody! Strike the sets! We’re wrapping up production and going home. Previous Article March 19, 2009: A Taste of the Other Side. With Cheese! And the Hugo Nominations. Next Article March 21, 2009: Hi! I was just in the neighborhood and thought I’d break in! Either I missed the SGU sneak or it did not run in Central time zone. Lots of promos for broadcast of the SG 1 films next two weeks. I just watched the trailer on YouTube. I couldn’t DVR BSG because of Dollhouse and Dog Town (two shows I’m not yet willing to give up..) and, from what I could see through the grainy-ness, I’m excited! It was good. I only watched it twice (so tired!) but had to come on here and spread the cheer. I’m so excited. I can’t wait. I even downloaded a Countdown app on my hand-me-down iPhone and set it for the premier date I found. So, very excited. How are your doggies? Are the upset-stomach issues getting straightened out? regarding the short story, you may be too close to it, as you suggest. Why not have one of your writerly-type friends read it and give feedback? Perhaps that’ll help shake something loose for you or at least offer you fresh perspective? Do you know if there will be an announcement anytime soon about who has been signed for the SGA movie, or does the signing wait until the script is done and approved? Thanks to the MGM site I got to see the trailer and I LOVED IT!!!! Speaking of the Memphis Blue Barbeque Restaurant here in North Vancouver (see everytime I am on Lonsdale). Plan on giving it a try one of these days. Let you know what I think!!! The trailer is available online for those among us who didn’t watch BSG tonight. It was edited together to make it seem all edgy and stuff, but all it did was hurt my eyes. I’m hoping the camera work won’t be so frenetic in the actual show!!! I thought the trailer was very impressive. I’m still concerned that this show will be too great a departure from the things that drew me to the original movie, and to SG-1, and perhaps not to my personal taste, but you are all clearly doing a wonderful job. The show is certain to find many fans. And I’m relieved to hear you say that there will be some humor and exploration… In any case, the acting, directing, and sets look top-notch. Congratulations! It’s been a while but I guess that’s what happens when I have to borrow a computer to even READ your blog. Thank you guys for the sneak peek: it looked really cool but I must confess that I didn’t make any connection to SGU until the title popped up on the screen. Sorry. I hope the weather is calmer up there than it is here… this is the beginning of severe weather season here on the edge of Tornado Alley. Speaking of, I hear thunder. Time to unplug stuff. From the SciFi chnl…you have to copy and paste the entire URL. Just watched the trailer on-line. Probably not a smart thing for me to do right now, considering how the day’s been (which I won’t bore you with). But it’s really hard to tell what the show will be like from such a brief clip – it certainly had a BSG feel to it, but given the time and place for the trailer’s debut, I understand. I just hope there isn’t a lot of screaming in the show…I can’t handle screaming – not in tv shows, not from animals in distress, not from crying kids, not from my dad and all those fights he had with mom when I was a kid. @#$#ing lack of an edit feature. 0.o Wasn’t it just like 29 seconds with words…..how can you possibly base your opinion on that!? I thought it was intriguing…intriging? intrig… GAH you know what I mean. ANd the gates red oooooooooooooh shiney! It looks like there are about a hundred people in one of the scenes. Just how many people were there at the base before they evacuated? There was an SG-1 episode on the other day and it seemed like there was only a couple of dozen people at the Gamma site. Will all those extras be in future episodes? Just saw the trailer. I liked! Looking forward to the darker edge with the Stargate humor we know and love. I just got back from my SGU Sneak Peek Party (watching two hours of some show called battleship galacticon or something like that so that I didn’t miss the SGU trailer…which wasn’t on the channel I was watching, but I watched it online afterwards anyways and it was great). Yup, it’s going to be awesome. Joe I just sent the link for the trailer to all my friends so they can watch. Was so glad that Syfy put it online. Turns out I didn’t have to see any BSG. I feel like Oliver at the orphanage asking for more porage… “please sir a bit more”. I understand that the first ones are short. I liked the trailer but wished it was longer. Is all of this going to happen again? The SGU promo gives me hope. What you wrote about it being dissected brings up an interesting topic. “You know, the XXXXX thing is going to be one of the great fiascos of the show, in terms of what fans thought and what the truth was. Because XXXXXX was not intended to be anything more than an interesting bit of backstory in that episode. And that’s how we approached it…That was all it was. I usually don’t like to go out there and say, ‘Oh, that’s a bad theory,’ because part of the enjoyment of watching the show is coming up with ideas. But this was gathering such momentum, I didn’t want people to be going into the finale and really be waiting for the XXXXXX shoe to drop, when there’s no shoe. The audience reaction to this character reminded me very much of the Furlings and the fan reaction to the simple mention of their name. I can already see the fan theories flying back and forth on the internet over the 30 second trailer and the split second gate apearance. I watched the East Coast feed and I could swear the promo said “And now a sneak peak of Caprica”– *shows Caprica logo* then they played the Universe teaser. Bit of a screwup. I was confused that Caprica had a stargate. I really like the way the trailer was filmed, with a darker harsher feel. Is that going to be the majority of how the show is filmed or were those scenes picked for their edgier look? I think, in a perfect green loves it world, the premium SG:U would be edgy but also still smart and witty, it would have action and adventure by the same ratio it would have intense character study, and it would have no sound effects in space. Now, I’m off to make my own series. Now wait a minute!!! After all the waiting and finally we have cast names, and a sneak peek…don’t blink cause it is so short…NO quitting – FCOL we don’t have at least one episode to view yet! Saw Robert Carlyle, Lou Diamond Phillips, a very blurry David Blue. A back drop of dust and blur and faces just barely visible for a nanosecond or more. Yes, that tease appears to be dark and a little or a lot apocalyptic. Would be nice to have story line to understand what was happening. But, I do believe quite a bit more is required for an informed opinion….LIKE 40 minutes with sound and dialogue and all that good stuff.